Globoidal Cam Indexer FD Series are CNC milled and profile hardened for ensuring desired durability to withstand harsh conditions. Available in cast iron body, these ensure high station to station accuracy and can be fitted with reducer and drive. Further, the universal mounting position and the never-ending rotational configuration of the shafts make this one of the preferred choices for application in any project. Through Hole Can Be Provided. High Station – to – Station Accuracy. CNC Cam Profile Milled and Hardened. Can be fitted with Reducer and Drive. Globoidal Cam Indexers are CNC milled and profile hardened for ensuring desired durability to withstand harsh conditions. 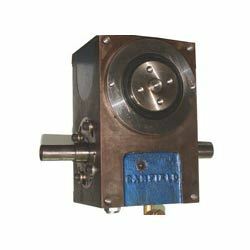 Available in cast iron body, these ensure high station to station accuracy and can be fitted with reducer and drive. Further, the universal mounting position and the never-ending rotational configuration of the shafts make this one of the preferred choices for application in any project. High station to station accuracy. Looking for Globoidal Cam Indexer for Packaging automation ?